Put together by the U.S. Department of Agriculture (USDA) and the U.S. Forest Service (USFS), this report provides the latest research on the social, health, and economic benefits of urban green space, with an emphasis on tree canopies. Research shows that more trees and green space in urban areas directly reduce pollution, reduce heat, encourage exercise and related health, lower stress, and improve longevity among residents. Overall, planting trees and increasing accessible green space contributes directly to the resilience of urban communities. 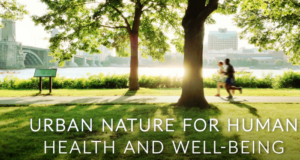 The evidence of the link between nature, health, and preventive medicine will hopefully spur more direct collaboration between the health, urban planning, education, and natural resource communities. With the growing pressures of modern life, these are critical connections to pursue; the answers to some of the biggest challenges facing these groups lie in the recognition of shared interests, goals, and objectives. This area of research will continue to grow in the coming years and decades, illuminating the essential role that nature plays in the health and well-being of our minds, bodies, and spirit. For more resources and education on the many benefits of urban tree canopies and green space, please visit the Vibrant Cities Lab, a joint project of the U.S. Forest Service, American Forests and the National Association of Regional Councils that merges the latest research with best practices for implementing green infrastructure projects in your community.